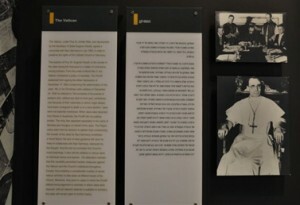 An inscription at Yad Vashem states that Pius XII‘s record during the Holocaust was controversial, and that he negotiated a concordat with the Nazis, maintained Vatican neutrality during the war and, formerly stated that he took no initiatives to save Jews. In 1985, Pietro Palazzini was honored by the museum, where he protested the repeated criticisms against Pius, on whose instructions Palazzini declared to have acted. 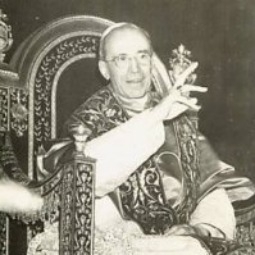 Palazzini, a theological advisor to the Pontiff, had taught and written about the moral theology of Pope Pius XII. 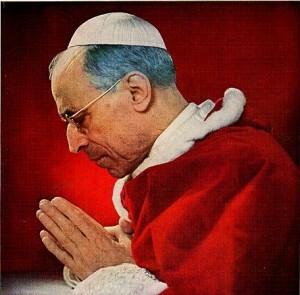 Rabbi David G. Dalin argues in The Myth of Hitler’s Pope that Yad Vashem should honor Pope Pius XII as a “Righteous Gentile”, and documents that Pius was praised by all the leading Jews of his day for his role in saving more Jews than Oskar Schindler. Rabbi David Rosen has taken exception to the caption, stating when Pius died both Moshe Sharett and Golda Meir sent telegrams stating that when darkness reigned over Europe, he was one of the few who raised his voice in protest. “What Yad Vashem says is not necessarily wrong,” conceded Rosen, “but it doesn’t give us all the information.” Rabbi Rosen later quoted eminent historian Martin Gilbert, who says that Pius saved thousands of Jews. In light of recent developments and research, on July 1, 2012 Yad Vashem changed the inscription to note a “considerable number of secret rescue activities” by the Church. Whereas the old text claimed the Pope did not intervene in the deportation of Jews from Rome, the new inscription says that he did not publicly protest.